Explore some of the geologic wonders along the Arizona-Utah border on this guided, 35-minute, small-group airplane tour from Page. See the amazing Rainbow Bridge National Monument, one of the world’s largest-known natural bridges. Learn about the history and geology of the area while flying over the Glen Canyon Dam and Lake Powell on the Colorado River, the second largest man-made reservoir in the United States. This exciting aerial tour lifts off from Page Municipal Airport in a fixed-wing Vistaliner. This plane offers the largest, flat, untinted panoramic windows of any touring aircraft, perfect for sightseeing and photography. 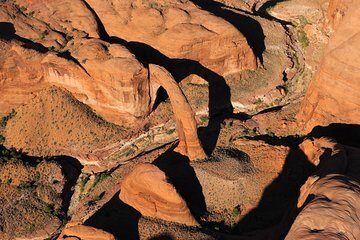 Begin by flying over the Rainbow Bridge National Monument, one of the world's largest natural bridges at 290 feet high and 234 feet long. More than 85,000 people visit the bridge each year and the neighboring American Indian tribes consider it to be sacred. Then enjoy the fantastic view over the bright blue waters of Lake Powell, a reservoir on the Colorado River that sits along the border between Utah and Arizona. It is the second largest man-made reservoir in the United States and a popular tourist destination. Also, see the Glen Canyon Dam, a concrete arch dam on the Colorado River. The dam was built to provide hydroelectricity and a regulated flow of water from the upper to lower Colorado River Basin. This Lake Powell and Rainbow Bridge tour ends with a return trip to the Page airport. The best value for ANY excursion we have ever taken! The scenery around Lake Powell is breathtaking any way you look at it. But to see it from the grand perspective in a safe comfortable plane with headphone playing inspirational music brought tears to my eyes. I went primarily to see Rainbow Bridge but that ended up being fairly minor in the scheme of things. This is a must!